Buttery, nutty and sweet, Don Juan Manchego lives up to its name as a world-class Spanish charmer. To be named Manchego, this wildly popular protected cheese must be made according to strictly regulated code in the La Mancha region, with milk exclusively from the Manchega breed of sheep. The sheep graze on wild flora unique to central Spain’s high La Mancha plateau, which imparts their milk with distinctive characteristics. Manchego is etched with the emblematic crosshatch pattern (called “pleita”) on its rind. To be named Don Juan, Manchego must be passionately produced according to artisan tradition, with the highest quality raw materials available. This Don Juan Manchego is carefully matured for 6 months, developing a more complex and deeper zesty flavor. 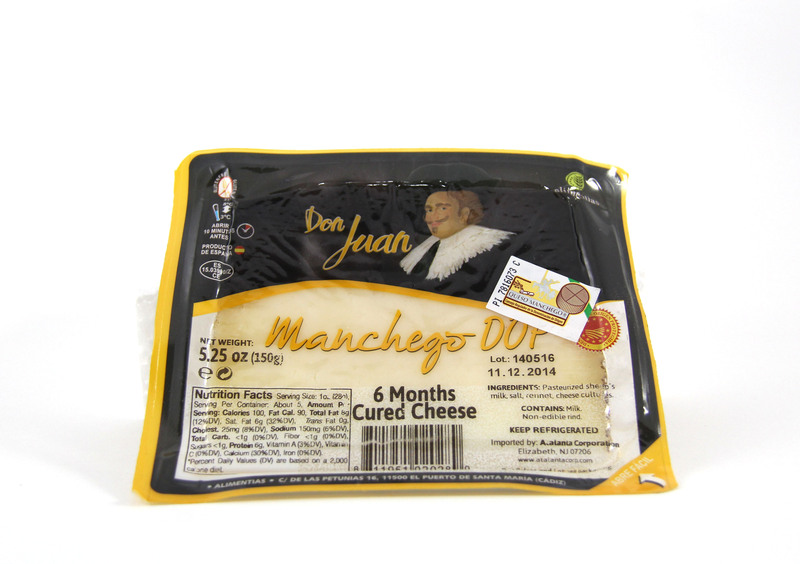 Compact and firm in texture, Don Juan 6 Month Manchego comes in ready to seduce wedges. Application: In Spain, the most typical Manchego preparation is to remove the rind, cut it into thin triangles (about 1/8” thick) and top each triangle with quince paste or honey. It is often served with nuts and/or Serrano ham and eaten as an appetizer or part of tapas. Don Juan 6 month Manchego will also add great depth and flavor when grated over soups, casseroles, mashed potatoes or salads. Pairing: A classic pairing is with Spain's famed Tempranillo based wines, such as a young Ribera del Douro, but also consider Spain's fine Grenache blends (Garnacha in Spanish). Founded in 1947, Revilla is a household name in Spain, representing the highest quality of Spanish traditional meats. There are many stories of how the sophisticated Spanish style of preparing and serving food called “tapas” started. The most popular tale suggests that tapas became a derivation of the Spanish verb “tapar” (to cover) when, centuries ago, small plates or flat breads were put on top of wine glasses to deter flies between sips. Eventually a range of snack-size foods were added, with cured meat being the first Spanish specialty ever used to top the topper. Whatever the origin of this elegant style of Spanish cuisine, Revilla Tapas Meat Assortment offers a conveniently packaged and delicious variety of pre sliced Jamon Serrano, Chorizo and Lomo. This assortment can be easily combined with other cold tapas, such as mixed olives and cheese (specifically Manchego), or warm tapas, such as puntillitas (battered fried baby squid), or it can simply be enjoyed on its own.